Have you noticed that gold is in vogue right now? I knew as soon as I saw the trend I would love it. I am sure it won't last too long...but while it's here, I am going to create using lots of gold. 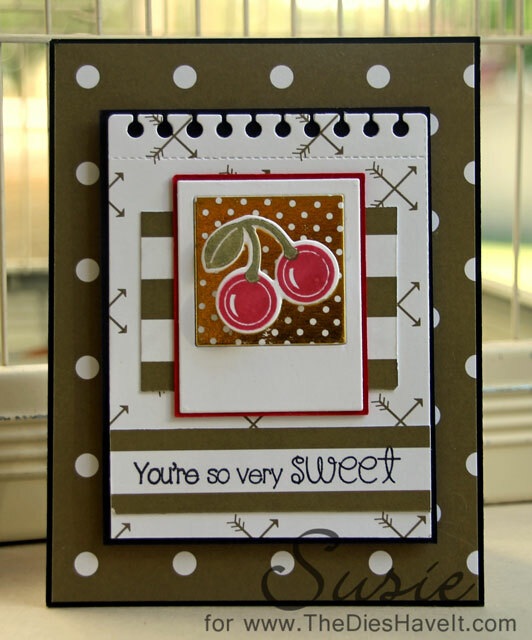 My stamped and die cut cherries are from Clearly Besotted. I noticed Simon Says Stamp has a new exclusive set with fruit too. Be sure to check out both. Since I already had this set, I had to fight diligently NOT to buy the SSS set too. It was hard, but I didn't buy it. I am entering my card in the SSS Wednesday challenge this week. You should play along too. Just follow the link. Gorgeous card Susie, everything is just perfect, love it.